After a violent bank robbery, a group of corrupt cops turned criminals led by ex-special forces operative Michael Atwood (Chiwetel Ejiofor) are blackmailed by Russian mob leader Irina Vlaslov (Kate Winslet) to pull off a 999, police code for officer down, to distract from an even bigger job. Disgruntled cop Marcus Belmont (Anthony Mackie) sees the perfect mark in his rookie partner (Casey Affkeck), but things inevitably get messier than intended, as hardened police detective Jeffrey Allen (Woody Harrelson) stays one step behind the crime ring and threatens to expose them. Although Triple 9 boasts a solid cast, this is a gritty potboiler that gets bogged down by too many characters and subplots, never really finding a clear purpose of its own. Aside from the all-star cast, who mostly do their best with the material, and a couple of well staged action sequences from director John Hillcoat, this is a pretty mediocre crooked cop thriller, that grows too convoluted for its own good and is often left feeling derivative of better films. The DVD also includes deleted scenes and two featurettes. 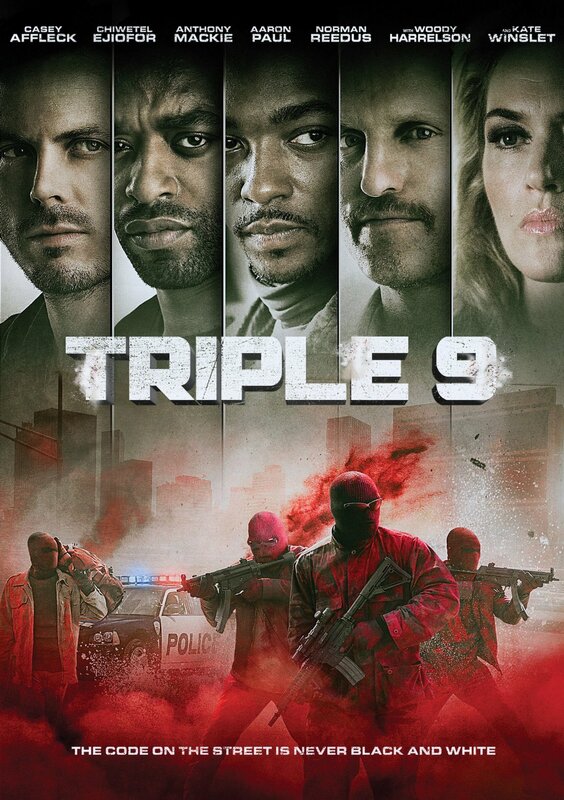 Triple 9 is an Elevation Pictures release. It’s 116 minutes and rated 14A.